Home Security turns out to be one of the most crucial areas to be addressed in Home Automation. The advancements in technology and concepts like real-time tracking has scaled up the level of home-security to a considerable extent. One always looks for a security system that keeps the user informed at the very moment the theft or any unwanted/undesired activity is detected, i.e. a security system that lets you take pro-active steps rather than corrective steps. Moreover, a good security system allows users to have remote monitoring or surveillance from far away locations and keeps them informed through immediate communication channels like SMS/e-mails/calls. This happens when any unwanted activity is registered by the installed sensors, and the built-in communication modules do the necessary work of informing the intended person immediately. Today there are a variety of PIR motion sensors, door/window sensor that trigger the activity at the right time. The D3D security system comes with a variety of such features. 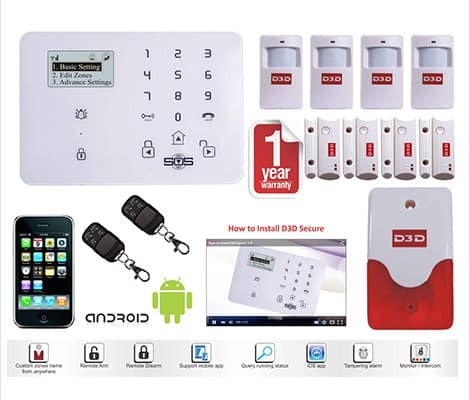 In addition to offering you remote surveillance capabilities and smartphone based notification alerts, the D3D security system comes with a variety of other features like Elderly Daily Care, Temperature Monitoring, Smoke/Gas sensing, remotely arm/disarm the system through call,SMS and keyfobs. Here is the Demo video for how the system will work in all. Lets look at all the features while going through a step-wise guide for how to configure D3D security system. As seen in the above figure, the front panel of the main unit consists of a Number Pad, a Menu/Dial Key, four navigation keys (up,down,left,bottom), a door-bell/alarm indicator, a microphone and a lock status indicator. The Number Pad can be used to straight away dial and phone number through the SIM card inserted in the Main Control Unit. The small microphone just below the Door-Bell icon lets you transmit two-way voice. Moreover, it also helps you to easily manoeuver through various settings options in the Menu. The Left navigation button with the lock icon also called as the Away Arm Button can be used to arm the system with a single press. Once pressed, you will see the lock icon beneath the door bell turn red. Similarly, the right navigation key also the unlock key can be used to disarm the system. Here, you will be asked for the system password to disarm the system. The down key or the SOS Help button can be pressed for any immediate emergency situations to get others registered contacts notified/alert soon in case of unwanted events. The up key also called as the Stay Arm Button can be used to arm your system when you going to bed or at home. The Door-Bell icon will continuously flash whenever an alarm is triggered. D3D also provides user the feature to connect an external wired doorbell module to its Main Control Unit. Similarly, you can also connect an electronic lock that can be locked/unlocked with the Key/Back icon on the Main Control Unit. The back panel of the Min Control Unit consist of the speaker for the alarm sound, the temperature sensor that displays the outside temperature on the front LED panel, a Temper switch that indicates the removal of mounting bracket via alarm sound and a Terminal cover beneath which lies the power connecting unit and SIM card slot. Open the SIM Card Slot and press and hold the Reset Button. Switch ON the main control unit. After 5 seconds, just release the Reset Button and the front LCD will display the message “Reset OK” and will put the system back to factory mode. The View Section basically keeps the records of all the alarms triggered as well as all the operations like ARM/DISARM performed on the unit. All the records are stored with the date and time of the specific events. Basic Settings: This section consists of various input setting functions like language, alarms, delays etc. Edit Zones: This section involves configuring and pairing of various RF sensor devices, remotes and wired devices. Advanced: This sections involves setting up of specific alerts for specific events. Let us discuss in detail the several functions that each of these sections have to offer. Setup Language: Among the variety of language options offered by D3D, select the language that is convenient for you to understand and operate. Setup Time: Here you need to enter the time and date when you are setting up the system. Setup Alert Number: D3D provides its users the facility to enter upto nine different mobile whom you wish to alert in case the alarm triggers. Also for each of the numbers entered, you will be asked as to how you want to get notified like by just a call, just a SMS or both call and SMS. Once you have entered these details you will be asked what action should the system take in case the stored number calls the system SIM number. This includes three options, shuffle between Away Arm to Stay Arm mode, Call – which automatically gets answered by the system and call that would be answered only after pressing the call button on the front panel. Temperature Alert: Here you will get to initially see both the High and Low Temperature to be pre-set at 99. Here 99 means that the Temperature Alert function is currently disabled. You can change the High and Low temperature setting by using the navigation keys. Armed Alert by Sound: Here the options Yes/No lets you select whether or not you want the sound notification once your system is Armed. Armed Delay Time: Here you can set the delay in time for system to get Armed once you have given the Arm input. This features is helpful in a way as you can exit the home premise by closing the doors before the arm mode comes into existence. Armed Alert Tel 1: This feature will allow the first registered (out of nine) number to receive a notification whether the system is Armed or not. Alarm Sound Time: This feature lets the user decide for what time the alarm should ring upon activation. The default setting for the same is 180 seconds. Alarm Delay Time: This is the time after which the alarm siren will sound after the alarm notification is received by the main unit or the system is being informed to sound the alarm. This setting is basically used to configure various sensor equipments like the PIR motion sensors, the door/window sensors, wired sensors or the remote keyfobs. Edit Wired Zones: This feature lets you configure some devices using the NO/NC sensors. Edit RF Detector: This feature lets you configure various RF sensors like the PIR motion sensor, door/window sensor, smoke sensor, gas sensor etc. AC Loss Alert: This feature notifies the user with a SMS, in case the AC Power has been off for the pre-set time. Here the default time is kept as 30 minutes which means that after 30 minutes when the AC Power goes Off, the user will be notified through a message. RF Opener Interlock: This feature can be used to operate your electronic lock and simultaneously Arm/Disarm your system with the help of a phone call. Timer: This feature can be used to set the Arm time, the Disarm Time and the Stay Arm Time based on the users daily routine. For e.g. the user can set the Arm Time at bed time 23:00 and the Disarm Time at morning 06:00. CID Protocol Over GPRS: The alarm system supports this feature which supports CID protocols to the CMS center over the GPRS data communication by setting it up through SMS commands. Modify Password: The system lets users set the 4 digit numeric password of their choice. The default password is 1234. Transmitter Coding: The system supports 3 wireless coding of which Coding 1 is default for the wireless siren. In Coding 2-3 the wireless siren is not functional. Panels SIM Card No: Here you need to enter the phone number of the SIM card you have used in the main control unit. Once the number is stored, you don’t need to set the date and time every time you turn on the main unit o after it is Powered Off. While configuring various setting parameters or sensors as described above in the main control unit, you might be asked to select various zone types which when configured for a particular unit, will cause the main control unit to respond under that conditions. [Read: Zone Type Explanations for the D3D security system]. In addition to the main control unit, all the above mention settings like arm/disarm, status inquiry, password modification etc, can also be remotely done by sending SMS commands to the phone number of the SIM that is inserted in the main control unit.